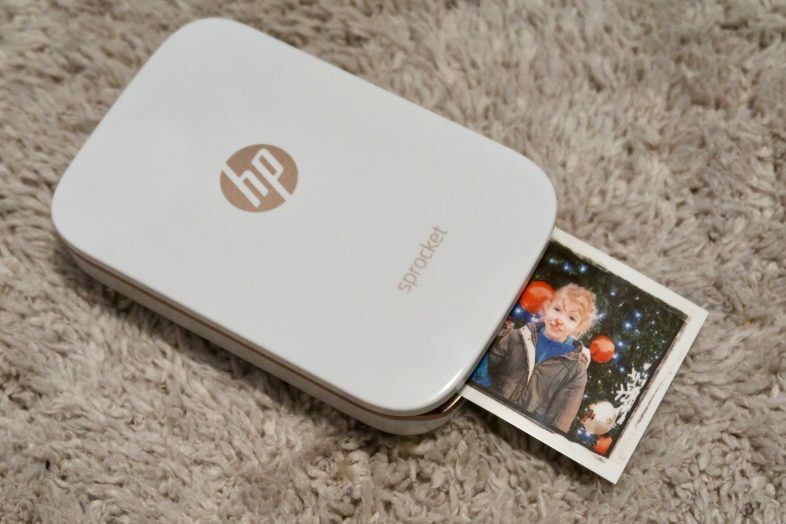 Manufacturer’s Description: With the HP Sprocket Photo Printer Limited Edition Gift Box, print photos from your smartphone or tablet as easily as you post them. Make time with friends more memorable with instantly sharable 5 x 7.6 cm (2 x 3-inch) snapshots or stickers of every fun-filled moment. And also get the HP rose gold wallet case, white and rose gold album and a voucher for free personalised slim included in this limited edition gift box. Review: This gift box bundle is the perfect present for anyone who loves to take photos but never quite gets around to printing any of them off to keep as mementos – basically, perfect for me then! 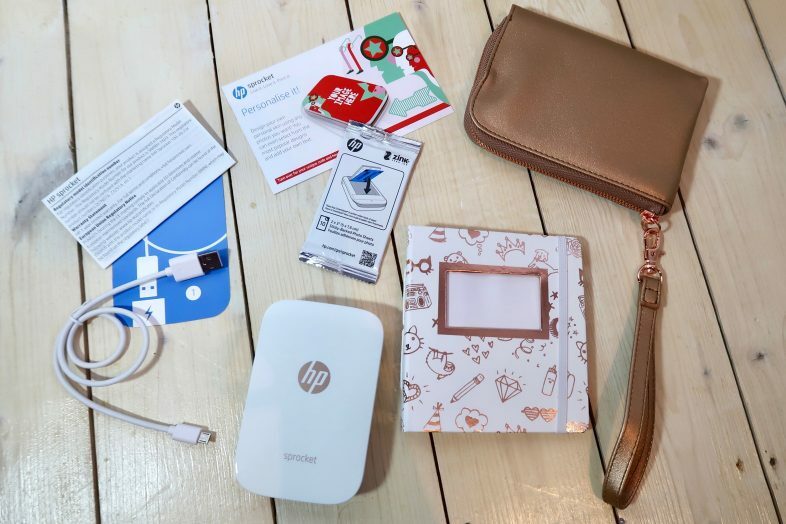 With a HP Sprocket mini printer, a beautiful rose gold carry case, and a mini photo album, it’s a great bundle to get anyone started preserving their special photos. 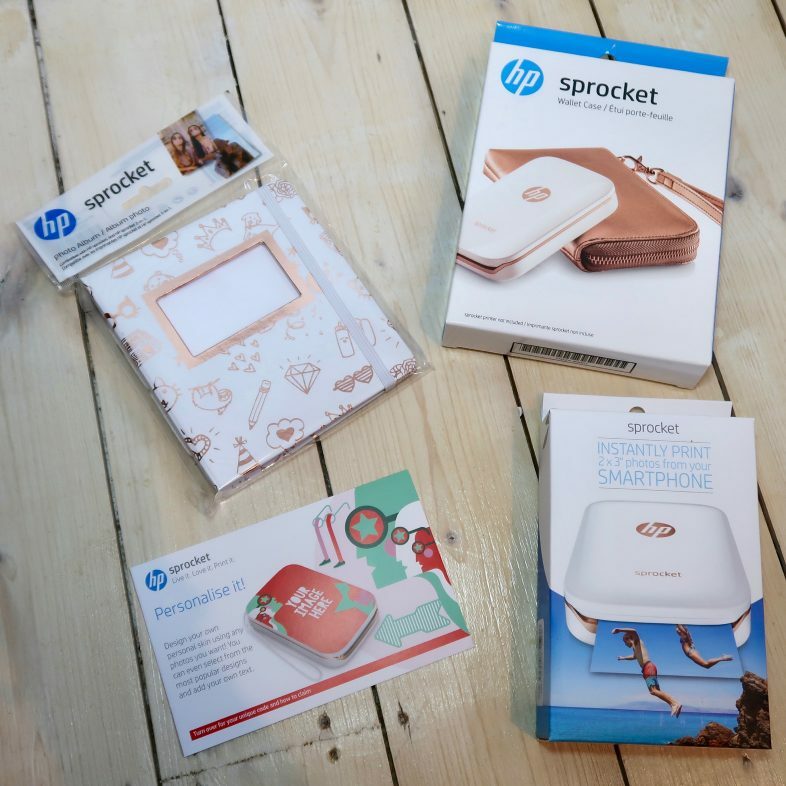 The bundle comes in an attractive gift box, and contains the White HP Sprocket Smartphone Printer, a Wallet Case, Photo Album, and a code for a free personalised Sprocket skin. The rose gold wallet case is the perfect match for the White HP Sprocket, which has rose gold accents, and it keeps it perfectly safe so you can carry your portable instant printer around with you. The attractive case has a wrist strap and an inside pocket big enough to store the USB cable and a packet of 10 sheets of HP ZINK paper for your Sprocket. The whole thing is small enough to slip into your handbag, along with the adorable mini photo album, which is really handy. I can already anticipate taking the HP Sprocket along to family functions and get togethers with friends. It’s a lot nicer to pass around an album of your favourite photos than it is to wave your phone at people, and being able to snap pics with friends and print them there and then. The album included in the bundle is really sweet, and matches the printer with rose gold detailing. A window in the front lets you slide one of your photos into place as a cover photo, and then inside there are pages with enough slots to store & display 64 photos. A small envelope pocket in the inside back cover lets you store a few loose photos or even a pack of refill paper. The whole thing is kept securely shut with a white elastic, and overall it is a really lovely high quality album, and a great way to keep your prints safe while carrying them around with you. 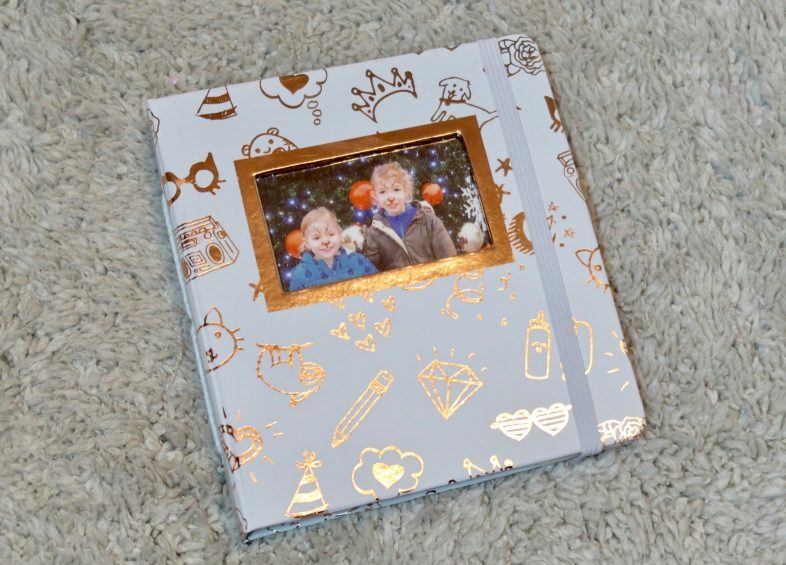 The personalised Sprocket skin code was really easy to use; the wrappz website had a good choice of designs to choose from, and I ended up ordering a three photo collage with some of my favourite photos of our family & the girls together. I’m looking forward to it’s arrival! It’s a nice addition to the gift box bundle, and worth over £10 when you take into consideration the delivery charge, which is included in the voucher. 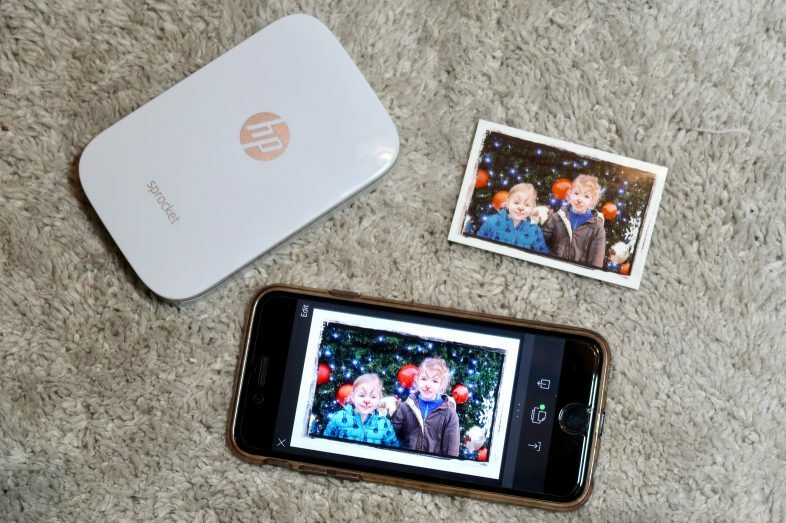 One of the things I love about the HP Sprocket is that unlike instant print cameras which have had a recent revival in popularity, you can pick and choose the photos you print out from your phone. This lets you print and keep your favourites while skipping the not-so-great ones. I use a high end compact camera which I carry around a lot, and I use the built in wifi on that to send photos to my phone to share on social media etc, while we are out and about. Now, I’ll be able to print my favourites there and then, too, and keep them safe in the album. 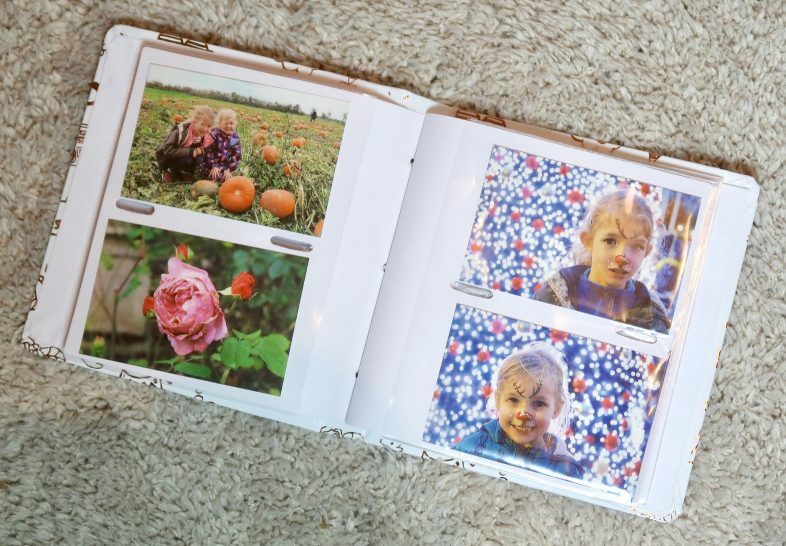 The HP Sprocket paper is sticky back too, so you can stick photos into your journal or wherever you like. The printer itself, along with the app, is really easy to use. It connects to your smartphone via bluetooth, and then you choose a photo from your albums or social media, and can edit it before printing. The app editing options are quite comprehensive, you can play with the brightness and so on, add frames, text, stickers, and even hand drawn doodles to your photos before printing. I can see it appealing to snapchat fans – it’s can be like a physical snapchat pic! You can queue up prints within the app while the printer is off, and then print them out one after another if you want, too – which is handy. Loading the paper into the printer is super easy, too. The top cover simply slides and lifts off so you can pop the paper into the printer. You get 10 sheets of the photo paper with the bundle, and you can buy more sheets in boxes of 20 or 50. The HP Sprocket uses ZINK (Zero Ink) technology which is incredibly clever; it uses heat at different intensities and time periods to make the colours appear like magic on the special photo paper. The prints are reasonably high quality – you’re not going to get amazing printouts but I think they are fantastic for the size of the printer and the fact that no ink whatsoever is required! You’ll never be in danger of running out of ink right in the middle of a photo with this printer, a problem I have run into way too many times. One other fun thing about the app & printer is that you can ‘scan’ any previously printed photo with the camera in the app and it will bring up ’embedded content’ for you to see on your screen. So, when I scan the photo above, the app brings up all our photos and videos from our day out at Drayton Manor at the weekend. Such a clever way to enjoy more memories associated with each photo. I think this bundle is great value, especially at its current price – the extra products are really nice. I actually saw the gift box advertised a week or two ago before I was offered this opportunity, and it was pretty high up on my Christmas wish list! 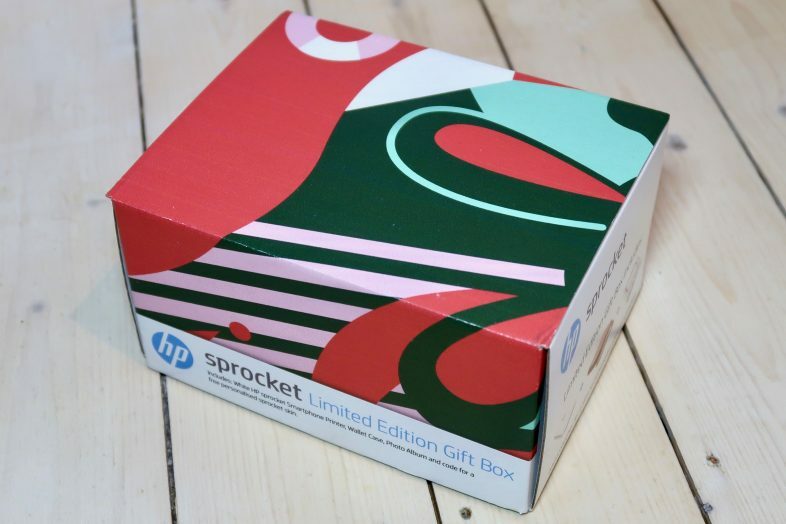 5 stars for the limited edition bundle – and for the HP Sprocket printer itself. I’m never normally fussed by gadgets and technology bits, but this looks fantastic! It’d be ideal for us, as nearly 19 months on and we only have 1 photo of Isla in the whole house!!! The photos are small but I like that to be honest, they are versatile! It won’t be long before I have them stuck all over the place, I’ve already stocked up on paper.